We got off to a slow start, but overall played a pretty good game against a very solid team. We never led in the game, but Florida could not put us away. We battled back from separate deficits of 12,9, and 7 to tie, but Florida always had an answer. My view for the first 8 minutes. Billy Donovan was smart enough to stay in a zone defense, and we continued to have the same problems against it that we have seen all season. Our guys have got to get some confidence in their shots. We look afraid to shoot at times, and we actually made a higher percentage of our 3 pointers than Florida did, of course Florida made more than we actually attempted. On the positive side, Trevor Releford was back to his old form. He finished some circus layups in the paint and generally took care of the basketball. JaMychal Green was a beast and kept us in the game when things could have gotten ugly. He was 8 of 9 from the free throw line, but that one miss was a huge one, that could have tied the game in the last 30 seconds. That was the story of the game, we played well but did not make the crucial plays when we had the opportunity. Levi Randolph made some freshmen mistakes, including telegraphing his pass which caused a turnover when we had a chance to take the lead late in the game. After battling back to tie it, we fouled their three point shooter, twice, essentially giving them 7 points. We still had a chance to tie at the buzzer, and Lacey got a decent look but his shot would not go down. Donovan did a good job of exploiting Jacob's defense when he was in the game. They would get him to switch on one of their 3 point shooters and pull him out away from the basket, where he is not very effective. Andrew Steele struggled, he was called for a couple of charging fouls and only got 2 shots off. I would like to see him work on a midrange game, like we see Levi do from time to time. I think word has gotten out that Andrew is going strong to the basket and hoping to draw a foul. It was a very small crowd, maybe 7,000 or so scattered throughout? We had a decent contingent, but it's impossible to compare our crowd to Florida's because the vast majority were wearing Kentucky Blue. Most of the Cats fans seemed to be pulling for us. 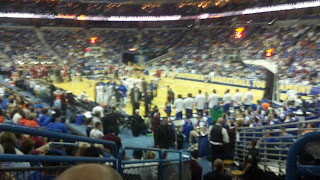 That was by far the worst NBA arena I have ever been in. Like many things in that city, it's as if the person who designed it was intoxicated at the time. 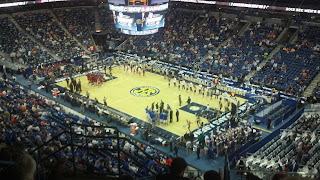 There were not nearly enough sets of stairs to get to and from the upper portion of the arena, meaning you had to walk a long way out of your way, and it created a bottleneck with the UK fans trying to leave after their game. The concourse is very narrow and jam packed with retail space. It took me nearly 20 minutes to go from entering the gate to my seat. The stats and display boards are somewhat oddly placed. Despite that, I wish they had the tournament there every year. New Orleans is an awesome city. Yes, it smells like a sewer, and is arguably the dirtiest town in American, but I love it. Everything is within walking distance, with the casino, river, french quarter, and sports arenas are all easy to get to. It's impossible to get a bad meal there. Everybody knows about ACME, Mother's, etc, but on weekends such as this when those places have ridiculous lines, you can go to any hole in the wall and you are probably going to get some good food. I wish I could recall the names of the places I ate yesterday. 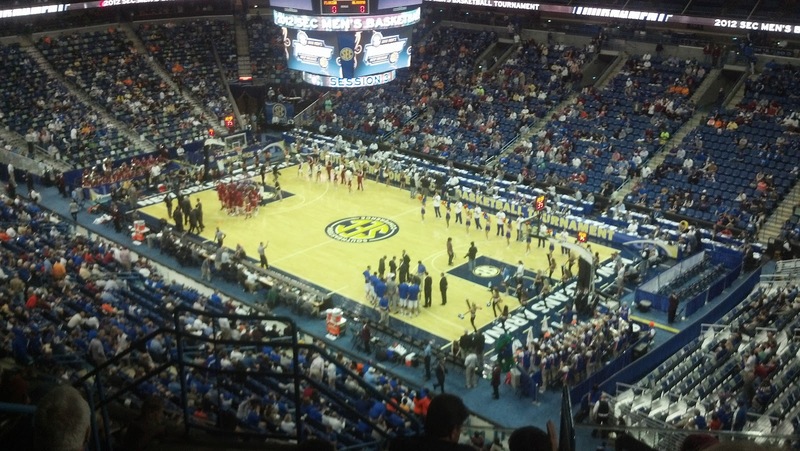 As usual, the Kentucky fans took over the city, which they dubbed as "Blue Orleans." Their fans are a lot of fun, and for the most part were very complimentary of our team and Coach Grant. I know a lot people don't like Coach Cal and his "one and done" system, but I really like this Kentucky team. They appear focused and play much better as a team than some of his past groups. Assuming we don't advance too far, I am definitely rooting for them to win the National Championship. Up Next, SELECTION SUNDAY! I fear we will be an 8/9 seed. If that is the case, we will likely either be in Pittsburgh with a 2nd round matchup against Syracuse, Greensboro in Duke's pod, or Omaha in Kansas' bracket. I am hoping we will either be a 7 or a 10, but after six long years, it's going to feel damned good "ALABAMA" on CBS tomorrow afternoon. news flash: mark gottfried is a dumbass. with over 8 mins. left, he and his staff doesn't know their leading scorer has four fouls. less than a minute after getting his fourth, he fouls out. during gottfried's tenure at alabama, i always felt the refs never gave us a fair shake at home because of their lack of respect for gottfried. doesn't look like thing have changed much with his move to the acc. one must wonder if espn is starting to realize their golden boy is a putz. I too dread the 8/9 matchup. The absolute worst potential second round matchup for us seems to be Syracuse. That 2-3 would ruin us. Here's to hoping we don't get put in their pod. I'll take ANYONE else.